Filipino Las Vegas Community Website, Mabuhay Kabayan! > Pinoy Business Search Shopping, Markets, Restaurants,Legal, Real Estate, More! HOW DO I SEARCH ON THIS WEBSITE? <<< Just click the "QUICK SEARCH" down arrow from the top of any page. Then just scroll down to the Filipino Business Category you would like to find ! (LAS VEGAS, NV) Manny Pacquiao (60-7-2, 39 KOs) took on Adrien Broner (33-3-1, 24 KOs) in the main event of tonight's show at the MGM Grand here in Las Vegas. Up next - Pacquiao vs.
UNLV Jump Start College Tour! Join the Asian & Pacific Islander American Scholarship Fund (APIASF) and UNLV at the APIASF Jump Start College Tour! High School Students and Parents. 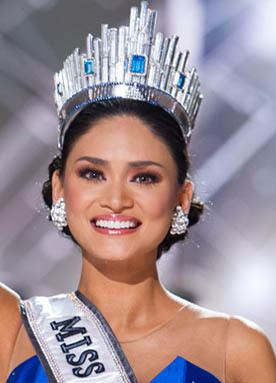 In a strange twist Host Steve Harvey wrongly announces Miss Colombia as Miss Universe and then realizes his error and corrects his mistake by announcing Miss Philippines as the New Miss Universe! plus LET and FAC fees Venue: M Pavilion (Indoor Event). June 12... "What does Independence Day mean to Ana "The Hurricane" Julaton?" Las Vegas gets ready for the May 2, 2015 Manny Pacquiao and Floyd Mayweather welterweight unification megafight that WILL be a part of boxing history! Sorry it didn't go the direction of the plan but the "Pacman" is still one of the greatest of all time! The suspected killer, Jin Ackermaan, has been apprehended and is now behind bars. The robbery took place around 5am Friday at the Walgreens on the corner of Durango and Cheyenne, Northwest Las Vegas. As we grieve our friend, Walgreens has set up a memorial fund account. If you wish to donate, please visit or contact any Wells Fargo Bank. Anyone with additional information is urged to call Crime Stoppers at 702-385-5555. You may also leave information online at www.crimestoppersofnv.com. Manny Pacquiao (boxing's only eight-division titleholder 57-5-2, 38 KO) defeated Chris Algieri (20-1-0) by unanimous decision to retain his WBO world Welterweight Title. Contratulations to Manny Pacquiao (56-5-2, 38 KO) who scored a unanimous decision in defeating WBO Welterweight Champion Timothy Bradley, Saturday night, April 12 at the MGM Grand Garden Arena here in Las Vegas. In the end of 12 full rounds the three judges scored the bout 116-112, 116-112 and 118-110. Manny Pacquiao now regains his welterweight title from his controversial loss two years ago to Timothy Bradley. MARTIN NIEVERA in Las Vegas! Venue: M Pavilion (Indoor Event). No Cameras or Video or Audio Recording. Hes appeared as a celebrity judge on The X Factor Philippines and his soulful performances have earned him 18 platinum, 5 double platinum, 3 triple platinum and 1 quadruple platinum albums. Ticket required for all guests age 2 and over. 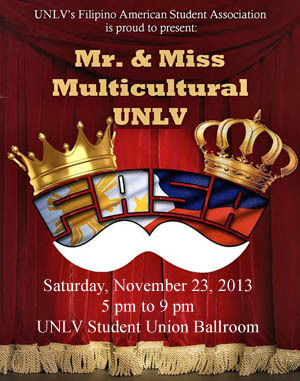 UNLV's Filipino American Student Association (FASA) is proud to present: Mr. & Miss Multicultural UNLV. Find out more about Journey's Frontman /Lead singer, Arnel Pineda !!! CLICK HERE to read more. More congratulations are in order, this time to Lani Misalucha, who has received the prestigious "Our Pick" (R-J Staff Pick) as Las Vegas Best Of in the Category of "SINGER" - as published in the annual "2008 LAS VEGAS REVIEW-JOURNAL 27TH ANNUAL BEST OF LAS VEGAS" yearly picks. Mabuhay Kabayan! During our completion of FilipinoLasVegas.com, please feel free to explore all that you like. If you're a Las Vegas "local," new to 'Vegas or even visiting from around the world, we would like to hear from you. Just click here to be taken to our Contact and Comments page. If you would like to suggest a Las Vegas area business or organization of Filipino interest or lifestyle, click here to visit our "Suggest a Business" FREE LISTING page. To quickly get started searching businesses, just make a selection from the "QUICK SEARCH" menu located on the left side of every page or visit our SEARCH page. FilipinoLasVegas.com is a site full of businesses and organizations with Filipino interest. We are also building a Community area listing of Filipino influenced activities around Las Vegas. Of course we'll need your help! When you can, please contribute by visiting our Contact/Comments page. While the estimates can vary greatly depending how you adjust outdated census findings, we can guess there are over 250,000 Asians, 30,000-50,000 of which are Filipino / Filipino-American people living in the Las Vegas valley. As the largest population all Asian groups here in the valley, we thought the Filipino community (and those who simply enjoy the Filipino lifestyle) was entitled to a Website to call "our own," no matter what our ethnic makeup is, and one that can ease everyday life of enjoying some of the comforts of home, no matter where we were born. With your suggestions, and some help from our staff, we hope to add other features to this site that will enhance everyday life, including a blog, recipes that you're proud of, the acceptance of advertising, and other ways for you to connect to the local community and for the community to get connected with you.